TOC investigates the death of foreign worker Mohamed Kamaluddin. By Andrew Loh. *Visit Migrants Workers Singapore for consolidated news reports and articles about migrant workers. All that most Singaporeans know about Mohamed Kamaluddin, 28, is that he is the Bangladeshi worker who contracted chicken pox and died in a dormitory in Tagore Industrial Avenue. Little else is known about him or his family – and the circumstances surrounding his death. The Online Citizen decided to find out and raises some questions. The Straits Times, on 31 Dec, said “an autopsy has identified heart and lung failure as the cause of death. It is not clear if this was related to his bout of chickenpox. A coroner’s inquiry will be held to ascertain this.” (See here and here.) The cause of his death, according to the death certificate which TOC obtained a copy of, was “cardio respiratory failure pending further investigations.” The time of death was recorded as 12.42pm. There has been no word from the coroner’s office so far about the coroner’s inquiry. Time of death aside, what is more troubling is the medical treatment, or lack of, which was given to Kamaluddin and the rest of the infected workers. TOC understands that Kamaluddin had had chicken pox for at least a week (according to news reports), though some workers told us he, and some others, had had the infection for as long as a month. This seems to be corroborated by photos taken by Mr AKM Mohsin, Chief Editor and CEO of Bangladeshi newspaper, Banglar Kantha. Mr Mohsin had visited the workers at the 468 dormitory on the 21st of November last year – more than a month before Kamaluddin died (28 Dec). The picture (right) showed several workers who had chicken pox and were being segregated from the rest. Notice that they are sleeping on the floor. It is, however, unclear if Kamaluddin was one of them. Mr Mohsin, who spoke to the workers during his visit in November, told TOC that the only treatment they received from their employer were a few tablets of panadol, according to what the workers said. After Kamaluddin was found dead, the rest of the infected workers, 10 in all, were then sent to Tan Tock Seng hospital to be treated. (See here). Gates Offshore had also deposited S$167 into Kamaluddin’s bank account. It did not say what this was for. The first question that comes to mind is one of potential negligence on the part of several parties. 3. The employer shall be responsible for and bear the costs of the worker’s upkeep and maintenance. This includes the provision of adequate food, as well as medical treatment. 6. The employer shall send the worker for a medical examination by a registered Singapore doctor as and when directed by the Controller. The employer shall also bear any medical expenses incurred by the worker for the medical examination. 7. The employer shall ensure that the worker is not ill-treated, exploited, wilfully neglected* or endangered. This includes providing the worker with adequate rest, as well as rest day(s) in accordance with the terms of the employment contract. The employer shall not involve or allow the worker to be engaged in any illegal, immoral or undesirable conduct or activity. Mr Paul Lee said that his supervisors had told him that Kamaluddin had gone for a run on the morning of the 28th, the day he died, and that he was not suffering from chicken pox. (See here.) If indeed this is true, it would bring into question the issue of competency of the supervisors – since Kamaluddin, by all accounts, had been suffering from chicken pox for at least a week prior to his death. Indeed, he hadn’t eaten for two days prior to his death too. According to the Straits Times, Lee said that “a dormitory supervisor goes on morning rounds to check if any worker is unwell.” If this was true, why did the supervisor do nothing to help Kamaluddin who had been sick for at least a week? According to what some workers told TOC, Kamaluddin was given some panadol tablets for his condition by the supervisors. If this is true, it would mean that the supervisors knew that Kamaluddin was unwell. Why, if this was so, was he not sent to the doctor’s then? And is administering panadol the standard medical treatment for workers who are sick, no matter what the illness? The Ministry of Manpower (MOM) seem to accept that Kamaluddin had died of “cardio respiratory failure”, as indicated in the death certificate, and has not, as far I am aware, probed further into the incident. In a Straits Times report on 21 January 2009, it said that those who contracted chicken pox in December last year were not quarantined. This would allow the infection to spread to other workers. Indeed, besides Kamaluddin, 10 others were infected with the chicken pox. Last November, the Manpower Ministry (MOM) checked the dorm and found it to be ‘non-compliant’. It said it told employers to move the workers out by today. The question is whether the MOM or the MOH did any follow-up after those warnings last year. Were the instructions complied with? Are the poor conditions and food the reasons for the latest outbreak of chicken pox cases there as well, as reported by the Straits Times on the 21st of January, where three workers have contracted the condition? The workers at 468 told TOC that they were given only two meals a day – one at 7am in the morning and another at 7pm in the evening. The meals consisted of a variance of “two pieces of bread” and “watery curry” in the morning, and rice and watery curry in the evening. At times, the food turned bad and the workers have had to throw them away. As a result, they would go hungry as they do not have money to buy their own food, since they are not given work and are not paid by their employer. Was Kamaluddin also given the same watery curry and rice/bread when he was sick? Had the food turned bad as in previous instances? Was this the reason why Kamaluddin did not eat the food on the two days before he died? Finally, is it MOM’s policy to allow “700 to 800” workers to be housed in such atrocious conditions? While MOM may have given warnings to errant employers about this, the fact that the workers have been there for months shows that MOM has been laxed in its enforcement. These questions remain unanswered. The employer seems to have been let off without any meaningful inquiry into the circumstances surrounding Kamaluddin’s death – particularly the question of willful negligence, which would contravene what is indicated in the EFMA. Mohamed Kamaluddin, who had been in Singapore for two months, was a kerosene seller back in his village of Gaffar Gaon, Bangladesh, before he came to Singapore. 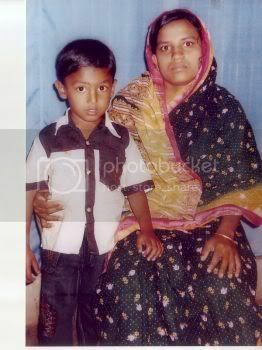 He has a wife, Shahnaz, and a son, Samrat, 5. His 70 year old mother, when told of his death, was so stricken with grief that she could not even speak a word. His wife and son now live with Kamaluddin’s elder brother, Shamsul, 48, a farmer. His family has assumed his debts and his wife will have to sell Kamaluddin’s own land when the creditors come calling in about 2 months. They had sold the family land and borrowed from friends to raise the S$7,000 for Kamaluddin to come to Singapore. Shahnaz, 24, presently depends on her in-laws to survive. Samrat has stopped going to school as they cannot afford to send him. At Kamaluddin’s funeral in his home town of Mymensing, 200 villagers turned up to pay their respects. He had been in Singapore for two months and was promised a job in the shipyards. In the end, he was paid S$167 – and only after he died. Many questions remain unanswered about Kamaluddin’s death. One can only hope that Kamaluddin’s story is one which will not be repeated. The only way, it seems, that if this were to be so, is for those who were derelict in their duties and responsibilities to be first held accountable. 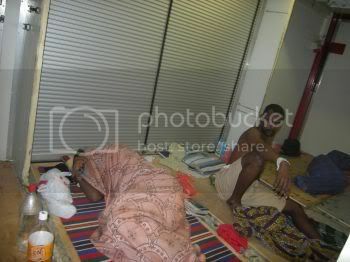 The workers at the 468 dorm were moved to another dorm at Seletar West Farmway 6 on 21 Jan 2009. See this report by Straits Times. Special thanks to Mohsin for the pictures. 179 foreign workers abandoned by employer by Boris Chan. Rights groups call for tighter regulations by TWC2 & HOME. TOC Expose: Repatriation companies by Jolovan Wham. A 19th century page from a 21st century draft by Ng Sook Zhen. “I hope Singapore government punish them” by Andrew Loh. The Story of Delowar by Deborah Choo. Mega Development projects and labour supply chains – who is responsible? by Stephanie Chok. Sent home with $600 by Deborah Choo.